Last night we had dinner with Hilary Swank. OK, the Oscar-winning actress didn’t show up at Portland’s top-rated restaurant Beast to dine with us specifically, but we were seated at the same communal table. She was there with her father and other family members, who apparently have connections with the local area. Hilary lived in Bellingham as a child, and her dad was a Portlander up until a few years ago. I didn’t know those things at the time, and even though Tara immediately recognized her, I had my doubts. It’s not everyday you have a run-in with a Hollywood celebrity in Portland, after all. But she kept insisting it was her, the star of Million Dollar Baby, Boys Don’t Cry and other films. I had to admit, there was more than a passing resemblance, but figured she was just one of those women people are always mistaking for somebody famous. Like the way people are forever confusing me with Matt Damon. Our dining companion last night. Tara asked the diners next to us whether they thought Hilary Swank was seated at our table, and they had already come to that same conclusion. Still, it wasn’t until we got home and I Googled her father that I was 100% convinced we had been dining with Hilary Swank. Because the old guy whose shoulder she was resting her head upon between courses was clearly, beyond the shadow of a doubt, Steve Swank, the same man whose picture was online. “Duh,” came my wife’s cool reply. This reminded me of that episode of The Office where the characters got into a debate over whether or not Hilary Swank is hot. I remember at the time being very much in the no-she-is-not-hot camp. But I have to say, she looks better in person. 5 years later I think I’ll officially change my position on the matter. Every course was fantastic. Highlights included the steak tartare, foie gras bon bon, carrot puree, fried chèvre, and dessert. Actually, I take that back. The whole meal was a highlight. We ordered it with the wine pairing (3 whites, 2 reds, 1 rose) and French press coffee with dessert. You might not want to look at the bill if you suffer from a heart condition, but this was Tara’s Christmas gift to me, so it was both a splurge and a special occasion. We would definitely do it again. I don’t think I’ve ever seen a movie with Hilary, but as a huge Bravo and Top Chef fan, I’m very familiar with Naomi! What a fabulous night you had! I did a post a few months back about how obsessed I’ve become with marcona almonds. Damn them! They are now up to $21.99 a pound at my grocery store. Wow. If I’d known marcona almonds were so pricey, I wouldn’t have left those couple of stragglers on my plate. But coming in at the very tail end of the meal like that, we were at the point where we had to pick and choose wisely. The cheese and honey won out. ” beyond the shadow of a doubt, Steve Swank, the same man whose picture was online. OMG Mark, you KNOW how starstruck I am so I would have died! I probably wouldn’t have been able to eat because I’d be too excited about sitting at the same table with HILARY SWANK. Who btw, I ADORE! Not only a great actress, but very pretty as well! I love her dark hair and dark eyes. Your meal sounded and looked faaaaaaaabulous! WOW! My mouth is watering just reading that. At first I was thinking, why would Hilary Swank be here of all places? But upon further reflection, it makes sense. Ties to Portland…one of the city’s most popular restaurants, run by a well-known chef who has appeared on TV more than once…where else WOULD she go? Burgerville? As much as I love their pepper bacon burgers, I don’t think so. Curious what Beast charges, if you don’t mind me asking. At The Kitchen, we partook in some of their extra things, like sake tasting, the tea with desert, and wine. We walked out of their with a nearly $500 bill. But we look at it as dinner and a play prices. And, like you, it was a memory. Certainly something you want to reserve for a special occasion. Wow. $500!! I hope that was the best meal of your life. 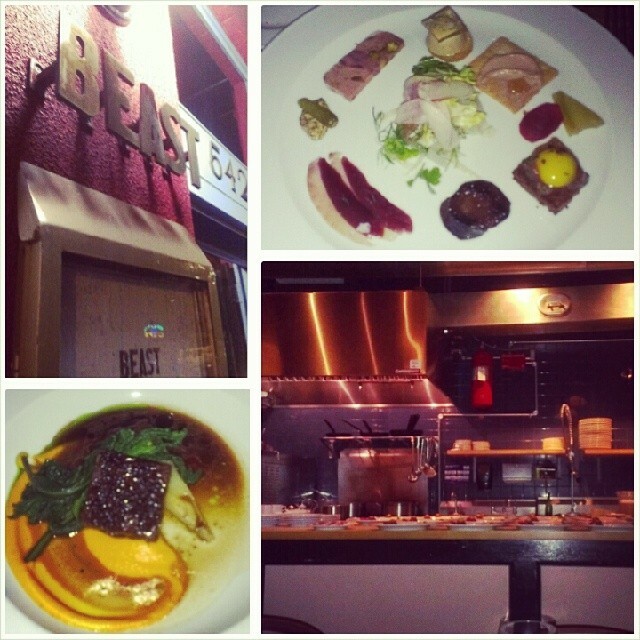 The dinner at Beast is $75. Add $35 for the wine pairing. That’s two really pricey meals we’ve had in six months – here, and Elway’s in Denver. Beast blew the other place away, hands down! Alright my friend I am going to ask the obvious question, if you questioned whether you were dining with Hilary Swank why would you not sneak a photo!? We are all curious! Lol! But that sounds like an amazing restaurant and a great time! I would love to go to a place like that! Now that sounds like an amazing meal. Sara would have gone nuts! And from reading the comments above, sounds like the prices were reasonable. That’s what I love about Portland. Even our excess isn’t excessive. You’d have to try really hard to spend more than that on a dinner for two in this town, though I suppose it could be done at one of the other “it” places. If you loaded up on cocktails, appetizers, and desserts. The meal sounds fabulous. Next time I am that way, this one goes on the list, from reading the comments above the prices sounds more than reasonable, even with the wine pairing. As to Hilary, I have never understood how any man could not find her Hot. But then I am a woman, I have always thought she is utterly beautiful.